BEDFORD, N.H. – March 29, 2010 – (RealEstateRama) — New Hampshire Housing Finance Authority recently named its 2009 top 10 loan originators. These individuals originated more than 110 loans and generated over $17 million in first-time home buyer mortgages through the Authority’s Single Family Mortgage Program. 1) Carol Jordan, Merrimack Mortgage Company, Inc.
2) Debbie Austin-Brown, Merrimack Mortgage Company, Inc.
6) Charley Farley, Merrimack Mortgage Company, Inc. The two top loan originators for 2009 are Carol Jordan and Debbie Austin-Brown, both are with Merrimack Mortgage Company, Inc. Merrimack Mortgage was also named New Hampshire Housing’s top lender for 2009. 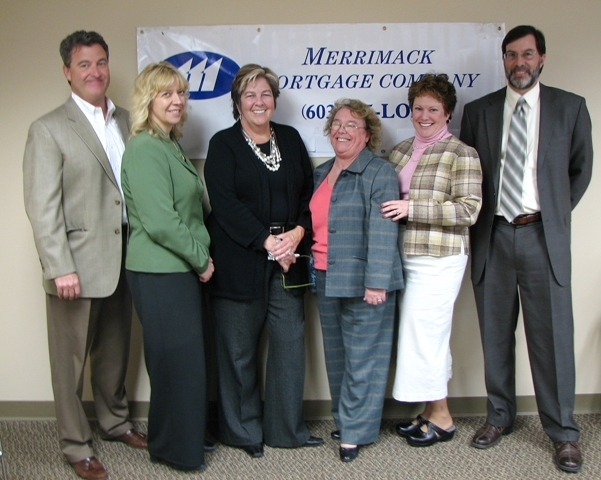 Pictured from left are: Dave Burns, Merrimack Mortgage; Debbie Austin-Brown, Merrimack Mortgage; Brenda Mahoney, New Hampshire Housing; Carol Jordan, Merrimack Mortgage; Lisa Welch, Merrimack Mortgage; and Dan McKenney, Merrimack Mortgage.